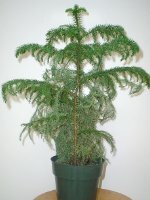 Along with Poinsettias, you will see lots of Norfolk Island Pines in the garden centers this time of year. These lovely plants, reminiscent of our North American pine trees are great houseplants, and many people decorate them for Christmas. But while they may look similar to pine trees, they are actually a tropical plant that won’t survive our Midwestern winters. As their name implies, Norfolk Island Pines come from, you guessed it, Norfolk Island. The island is located in the Pacific Ocean between Australia and New Zealand. The trees and the island were discovered by James Cook, the renowned British explorer. In their native habitat, the trees can grow to 200 feet (65m) and it was thought that they would provide masts for sailing ships. Ultimately, it was discovered that the wood wasn’t suitable for this purpose, however. Being native to the southern hemisphere, the trees will grow in southern Florida and California in USDA zone 10. They will begin to suffer damage from the cold at temperatures as low as 40 degrees (5c). For the rest of us they make lovely houseplants that are relatively easy to care for. They will tolerate shade but would like at least a couple of hours of direct sunlight every day. The most difficult part of growing them inside is that they do benefit from a high relative humidity. This can be achieved by placing the pot on a tray of stones and keeping water in the tray, but don’t let the pot stand in the water. Misting them once or twice a day depending on the humidity in your home will also work. Water the plants well when the top inch or so of soil dries out. Fertilize them every three months or so with a balanced fertilizer. They enjoy normal daytime household temperatures and also like it to be a little cooler at night. They will also benefit from repotting every couple of years. Use a commercial potting mix that drains well. Seeing that in their native habitat the trees will grow quite tall, a well-cared for Norfolk Island Pine may grow three to six inches per year and eventually outgrow it’s indoor habitat. They can be cut back, but if that is done, they should be cut back low and the tree will grow back. It is also possible to root cuttings but trees produced from branch cuttings will not have the same symmetrical shape as the original tree.